You are few step away to get your GST Registration. Captcha*: Please prove you are human by selecting the Tree. Captcha*: Please prove you are human by selecting the Cup. Registration of any business entity under the GST Law implies obtaining a unique number from the concerned tax authorities for the purpose of collecting tax on behalf of the government and to avail Input Tax Credit (ITC) for the taxes on his inward supplies. Without registration, a person can neither collect tax from his customers nor claim any credit of tax paid by him. Entities with an annual turnover of 20 lakhs INR (10 lakhs INR in case of north-eastern states) and above would be required to register under GST. The eligible entities must file GST application within 30 days from the date on which the entity became liable for registration under GST law. Captcha*: Please prove you are human by selecting the Car. Entities supplying goods or services with an annual aggregate turnover of more than 20 lakhs INR in most States are required to register for GST mandatorily. In north-eastern states, the aggregate turnover has been reduced to 10 lakhs INR. GST registration is mandatory in case of supply of goods or services from one state to another (inter-state). 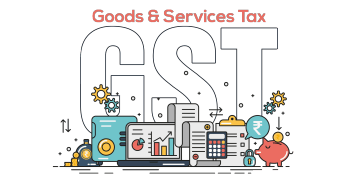 For example, if a business in Delhi supplies goods to a business in Haryana, then GST registration is required. Every e-commerce operator and the person who supplies via e-commerce operator is supposed to get registered under GST. Entities having service tax or VAT or central excise registration must be registered under GST mandatorily. This category includes the person who occasionally undertakes supply of goods or services having no fixed place of business. If a person fails to pay tax, he has to pay a penalty of 10% of tax due or subject to a minimum of 10,000 INR. Apart from that, if the person is not registered under GST, then a penalty of 100% of the tax amount due has to be paid. Captcha*: Please prove you are human by selecting the Heart. Captcha*: Please prove you are human by selecting the Flag. 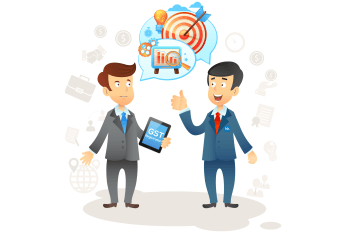 But, why go through a complex process when HostBooks is right by your side? 1What will be the effective date of registration? Where the application for registration has been submitted within thirty days from the date on which the person becomes liable to registration, the effective date of registration shall be date of his liability for registration. 3. Registration 28 29 Where an application for registration has been submitted by the applicant after thirty days from the date of his becoming liable to registration, the effective date of registration shall be the date of grant of registration. In case of suomoto registration, i.e. taking registration voluntarily while being within the threshold exemption limit for paying tax, the effective date of registration shall be the date of the order of registration. 2If a person is operating in different states, with the same PAN number, whether he can operate with a single Registration? 3Whether a person having multiple business verticals in a state can obtain for different registrations? 4Is possession of a Permanent Account Number (PAN) mandatory for obtaining a Registration? Yes. Every person shall have a Permanent Account Number issued under the Income Tax Act, 1961 (43 of 1961) in order to be eligible for grant of registration under Section 19 of the Model GST Law. However, as per section 19 (4A) of MGL, PAN is not mandatory for a non-resident taxable person who may be granted registration on the basis of any other document as may be prescribed. 5Whether the Registration granted to any person is permanent? Yes, the registration Certificate once granted is permanent unless surrendered, cancelled, suspended or revoked. 6Is it necessary for the Govt. organization to get registration? 7Whether Cancellation of Registration Certificate is permissible? Yes. Any Registration granted under this Act may be cancelled by the Proper Officer, in circumstances mentioned in Section 21 of the MGL. The proper officer may, either on his own motion or on an application filed, in the prescribed manner, by the registered taxable person or by his legal heirs, in case of death of such person, cancel the registration, in such manner and within such period as may be prescribed. 8What happens when the registration is obtained by means of wilful mis-statement, fraud or suppression of facts? In such cases, the registration may be cancelled with retrospective effect by the proper officer. Section 21(3). 9Whether all assessees/dealers who are already registered under existing central excise/service tax/ vat laws will have to obtain fresh registration? No. GSTN shall migrate all such assessees/dealers to the GSTN network and shall issue GSTIN number and password. They will be asked to submit all required documents and information required for registration within the prescribed period of time. Failure to do so will result in cancellation of GSTIN number. The service tax assessees having centralized registration will have to apply afresh in the respective states wherever they have their businesses. 10Is there any facility for digital signature in the GSTN registration? Taxpayers would have the option to sign the submitted application using valid digital signatures (if the applicant is required to obtain DSC under any other prevalent law then he will have to submit his registration application using the same). For those who do not have a digital signature, alternative mechanisms will be provided in the GST Rules on Registration. 11What will be the time limit for the decision on the online application? If the information and the uploaded documents are found in order, the State and the Central authorities shall approve the application and communicate the approval to the common portal within three common working days. The portal will then automatically 40 41 generate the Registration Certificate. In case no deficiency is communicated to the applicant by both the tax authorities within three common working days, the registration shall be deemed to have been granted [section 19(9) of MGL] and the portal will automatically generate the Registration Certificate. 12What will be the time of response by the applicant if any query is raised in the online application? 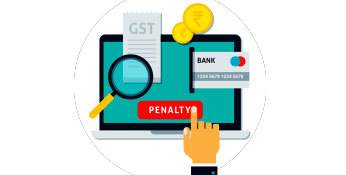 If during the process of verification, one of the tax authorities raises some query or notices some error, the same shall be communicated to the applicant and to the other tax authority through the GST Common Portal within 3 common working days. The applicant will reply to the query / rectify the error/answer the query within a period informed by the concerned tax authorities (Normally this period would be seven days). On receipt of additional document or clarification, the relevant tax authority will respond within seven common working days. 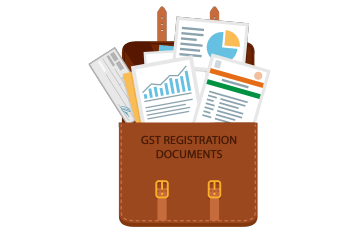 13Can the registration certificate be downloaded from the GSTN portal? In case registration is granted, the applicant can download the Registration Certificate from the GST common portal.